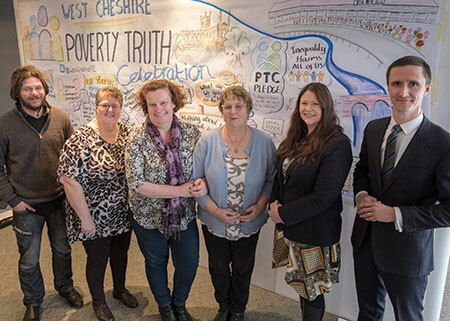 Local civic, faith and business leaders attended the West Cheshire Poverty Truth Commission (WCPTC) celebration event this week (Wednesday 28th February) to listen to the success and achievements of the commission. Residents in Cheshire West and Chester came together over a year ago to form the WCPTC and help make change to public policy. These residents have experienced change on a personal, local and potentially national level and had their own individual stories to tell at the event. Poverty in the UK is a growing concern with 13.5 million people living in poverty and 3.9 million of which are children.1 In the North West there are 1.5 million people living in poverty.1 There are more and more people in working families in poverty when compared to five or ten years ago.1 Over the past year, Cheshire West and Chester has seen a 13% rise in the number of people using a Foodbank in the borough.2 Over one in five people affected by benefit sanctions in the borough was a child. The WCPTC brings together some of Cheshire West and Chester’s key decision makers with those living at the sharp end of poverty. The commission believes poverty will only be truly addressed when those who experience it first-hand are at the heart of the process. Dedicated residents supporting the commission, now called Community Inspirers have worked alongside civic and business leaders over the past year to highlight their own experiences and struggles they have faced. The groups have met regularly with clear action plans in place, looking at processes, problems with systems and potential solutions. The West Cheshire Poverty Truth commission has been successful in raising the profile of poverty, having been invited to the House of Commons to share their experiences with MPs on the impact of Welfare Reform, including Benefit sanctions, Universal Credit and PIP Assessments and suggesting possible solutions to current systems. The Work and Pensions Select Committee has welcomed written evidence from the WCPTC on experiences of PIP and ESA assessments, as well as Universal Credit. This written evidence, once submitted, will be discussed at the Work and Pensions Committee in the House of Commons. Media coverage of the WCPTC has also highlighted the growing concern of poverty in the UK, with Community Inspirers appearing on the Sunday Politics Show, BBC News and Dee 106. The commission has also opened up new opportunities to the Community Inspirers, with a few securing permanent jobs and voluntary work and others actively seeking work. The commission has worked closely with local organisations and services to improve processes. Their work has included contribution to improved style of housing benefit letters sent out to residents, as well as inputting into a more reader-friendly Local Offer website. The WCPTC are encouraging organisations to sign their pledge, encouraging the development of a two-way relationship rather than transactional processes. 'I pledge to treat you how you want to be treated.' The pledge emphasises respect being two way with employees being open, honest and respectful to all customers at every interaction. The pledge hopes to have a positive impact on the mental health of people in vulnerable situations. For more information on the pledge, please go to www.cheshirewestandchester.gov.uk/povertytruth. The second West Cheshire Poverty Truth Commission will commence in summer 2018. If you have experienced poverty and are interested in getting involved in the second commission in the borough, please email WestCheshire.PovertyTruth@cheshirewestandchester.gov.uk.